A few days ago I launched my new website. In fact, it’s so totally different from the one I had that I even changed the URL. From now on, you can visit me at http://www.yvesletermeletters.com. You’re welcome at all times, day and night. It’s the place where you can have a look at my portfolio and watch some video’s, where you can see what workshops are scheduled for the coming year, what services I’m offering and – this is new – where you can sign up for my Newsletter and order some of things I have for sale. I hope you’ll like it. For the occasion, and also because it’s nearly Christmas (well, sort of), I’m announcing a Special Holiday Season Offer. See on my Shop-page what discount you can get on ordering the famous Litterae-box, which still happens to be one of the nicest presents you can give to your letter loving friends. Last week I returned from my yearly Spring tour. This time my trip lasted three and a half weeks during which I visited New Orleans, Ottawa, Kalamazoo and Iowa City. Plenty of things to see, plenty of time spent with nice people and eager students. These weeks are always so intense, compared to my normal life between desk, computer and bed, but I like every minute of it. On my webpage (see ‘workshops’) I posted some collage-pictures of the places I ‘v been asked to come and teach in the past years. If you or your guild would want me to conduct a workshop next year, let me know: if possible, we can arrange for another tour and keep the travel costs to a minimum. One of my favourite workshops is the one in which I take my students from formal Italic to gestural Italic, explaining all the principles and revealing all the secrets (or at least the ones I know about). I made a little video about it and put it on Youtube. https://www.youtube.com/watch?v=x47h9pAUdWU Please, feel free to share. This year, I’m teaching a few workshops in Germany. I recently taught in Hamburg and Niederainbach. In the near future I’ll add Nördlingen and Stuttgart to that list and in Fall, there’ll be a workshop for Klingspor and one in Hamburg again. I love teaching, so keep it coming – I seriously consider any proposal that comes my way. O.K., that’s about it for the update now. Since my first book Thoughtful Gestures went out of print two years ago, I received numerous requests from calligraphers and students for a copy and each time I felt sorry I had to disappoint them. Now, I can offer the e-book version, to which I added an extented gallery of another 16 pages, showing more recent work. The e-book can be ordered for only 12 euro, but the really good news is that it’s completely FREE for all who bought or will buy the Litterae-box. Call me crazy, but I merely wanted to make a ‘thoughtful gesture’. For more info on how to order or contact me, see attachment. The set is (or will be) available through John Neal, but you can also order directly through me (in that case, there’s a nice discount on group orders, an additional present of 3 Litterae-bookmarks and reduced shipping costs). For more info, pictures and ordering, send a mail to yvesleterme@skynet.be or visit http://www.yleterme.be. 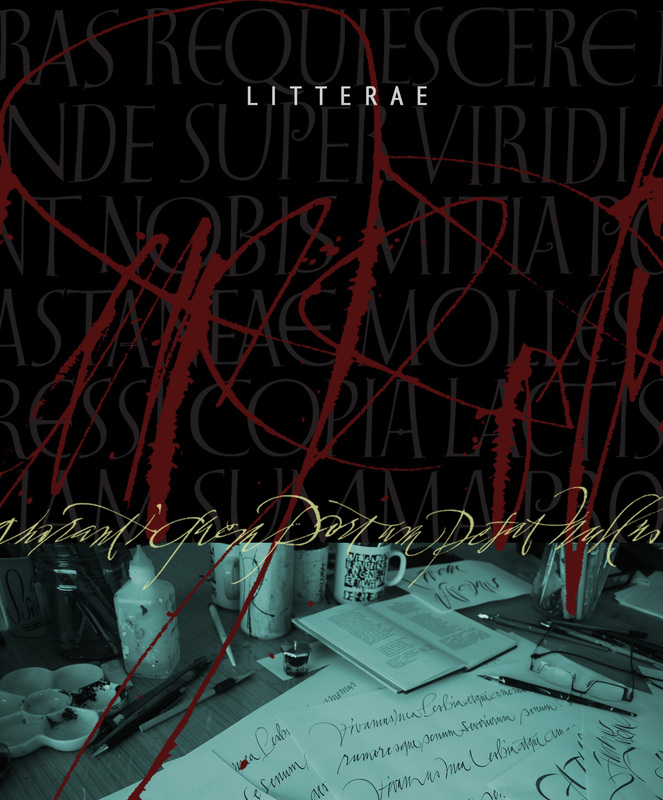 I also made a presentation video of Litterae and put it up on Youtube and Vimeo. Here’s the link to Vimeo: https://vimeo.com/98820894 Hope you’ll enjoy watching it. It felt like bungeejumping – not that I ever did that though. I had checked about a hundred times all my designs and texts but it was still with a trembling finger that I clicked the send-button to send it all off to the printer. In the coming week, thousands of cards, boxes and booklets will be delivered at my doorstep for me to assemble them and then (hopefully) ship them to whoever wants a copy. Litterae will presented as a box containing 24 A5 cards with Latin texts in calligraphy. All texts are translated and commented with further illustrations. It will provide information on the Latin authors, the chosen quotes and why I interpreted the texts the way I did. I turned out that I didn’t print enough copies of my book ‘Thoughtful Gestures’ three years ago, so this time I made sure I’ll be able to deliver. So stay tuned – I’ll announce it very soon with all details. Here’s a little teaser for now. Two things… I want to announce two workshops I’ll give in Hamburg from 7 til 10 November 2014. One is on pointed brush (see picture) and the other is on flat brush Rustics. If you’re interested you can contact me (yvesleterme@skynet.be) and then I’ll put you in contact with the organizer, Anja Luedtke. The other thing I wanted to say is that I’ve been working very hard on a series of 24 calligraphic interpretations of some of my favourite Latin texts. Along with the prints, there’s additional information about the author, the chosen text and the reasons why I opted for that particular approach. As I wanted this collection to be the result of my very best efforts in writing and composing, I have been picky in choosing and merciless in refining, but now that the end is in sight, I’m very glad with the result so far. It is meant not only to speak to calligraphers but also to anyone who’s interested in the Roman legacy. I hope to bundle them shortly and publish them. You’ll surely get to hear more about it, but I wanted to send this notification ahead already. I'm a calligrapher/lettering artist who, besides teaching and spreading his doubts in all corners of the world, spends his time making commercial and artistic work. In a parallel life I'm teaching Latin to young adolescents in my hometown Bruges.